Butchers "The Midg" Falling quarter plate camera. Photograph gallery. 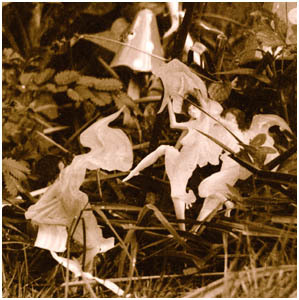 During 1917, two Yorkshire girls produced photographs of fairies in their Cottingley garden. Griffiths (age 10) used a Houghton Butchers Midg camera and possibly one other. 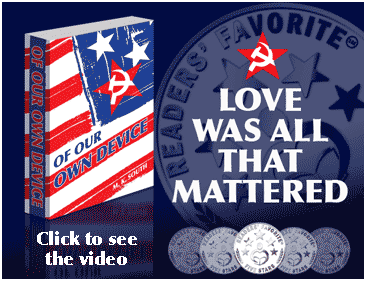 Their story can be read here. Given this fact I decided that our Midg should mimic the act, and using the same illustration that had likely inspired the two girls (Illustration for Alfred Noyes' poem "A Spell for a Fairy" in Princess Mary's Gift Book by Claude Shepperson, Hodder and Stoughton, c. 1914) concocted three dancing nymphs and sat them in the garden to become "The Bishopstoke Fairies'. With the Midg using the closest focus lens at 4ft and wide open at f/11 and hand held at 1/25th sec. If nothing else, it proved that these two girls did very well, for their efforts are significantly better than mine. Despite the somewhat tired state of our Midg it proved to be lightproof and reliable. At a later date I will attempt a better mimic of the fairies picture. 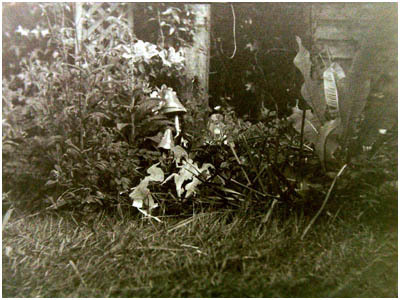 The original Cottingley Fairies camera survives to this day in the National Museum of photography in Bradford and can be seen here, you will see that it differs in a number of details.